Recently I was at a retreat center in the mountains of Upstate New York where I spent the weekend with a group of extraordinary men, clearing brush, preparing cabins for the summer season and celebrating brotherhood. Something I can’t help but notice whenever I spend time in this community of men is the way in which non-sexual touch is used as a powerful form of communication and community building. It happens virtually ever hour, in one way or another. A good friend and I experienced a minor conflict a few days ago. We knew that we needed to spend a few minutes talking about it, and since we were both headed to the mountains for the weekend, we agreed we’d find time for each other then. During an organizational work meeting Friday evening, he reached over and took my hand, and he held it for a good long time, perhaps 15 or 20 minutes, with genuine affection I couldn’t help but feel. I don’t even remember much about what the original conflict was about, to be honest. Our bodies worked it out. Without the clumsiness of words, a physical gesture based on touch between our two bodies was able to sufficiently resolve what had been a minor irritation. When we asked each other later whether we had anything more we needed to say to each other, we both agreed that our bodies had worked it out for us. It is not at all uncommon that men here will spontaneously form little clusters on the floor that we affectionately refer to as “puppy piles.” Someone will rest his head on another person’s chest while having a conversation, or two or three guys might snuggle up together in front of the fire. It sometimes takes new visitors a minute to figure out that these behaviors aren’t about dating or mating–they’re mostly about brotherhood, an intense sense of friendship, devotion and safety that men experience with each other. A hundred years ago, no one would have considered these behaviors exclusive to gay men. 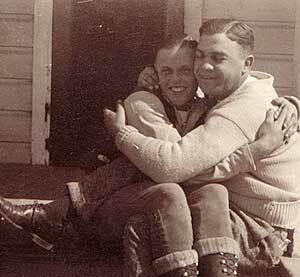 They were behaviors common to all men in a culture which permitted us to be supportive, affectionate and mutually affirming. Click here to read an insightful article in the Christian Science Monitor which details how the decline of warm, supportive touch over the past 200 years puts all men at risk, because it denies us something we genuinely need from each other. Sometimes our bodies work things out through the communication of touch which might take many more minutes using words, which can seem remarkably limited. Men are able to extend loyalty, non-competitive posture, and support without a word. In my own Touch Practice, men who have experienced trauma or difficulties in their bodies are often able to communicate what they have experienced–and what they need–in a way which makes verbal language seem fairly limited in comparison. Want to see some pictures of what “real” men looked like 100 years ago? Check out these photos, and be amazed at how far we have come–and how much we have lost.